The terminal compartment incorporates a 'double seal' to prevent moisture ingress, this comprises an O ring seal positioned on the terminal cover, with a second O ring seal positioned on the terminal bung itself; this arrangement ensures that even with the terminal cover removed water cannot enter the actuator main housing, which remains clean and dry. In order to achieve the high 0.1% resolution, two independent positions sensors are used to eliminate backlash effects in the gearing. The sensors are 12 bit rotary magnetic encoders one on the motor output and the other near the output shaft of the actuator. The CVA uses a high efficiency brushless DC motor. 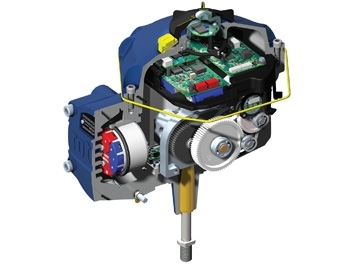 This allows the actuator to provide trouble free operation even with continuous unrestricted modulation duty. Simple yet durable high efficiency spur gear drive lubricated for life with proven high reliability.